Damian Robert Nesta "Jr. Gong" Marley (born 21 July 1978) is a Jamaican reggae artist. Damian is the youngest son of reggae musician Bob Marley. Damian was 2 years old when his father died; he is the only child born to Marley and Cindy Breakspeare, Miss World 1976. Damian's nickname Junior Gong is derived from his father's nickname of Tuff Gong. Damian has been performing since the age of 13. At age 13, he formed a musical group by the name of the Shephards, which included the daughter of Freddie McGregor and son of Third World's Cat Core. The group opened the 1992 Reggae Sunsplash festival. The band fell apart in the early 1990s and Damian started his solo career. With the backing of his father's label, Tuff Gong, he released his 1996 debut album Mr. Marley which surprised many who were unaccustomed to hearing a Marley deejaying rather than singing. Marley released his second studio album Halfway Tree. The name "Halfway Tree" comes from his mother, Cindy Breakspeare, being from the rich part of town, and his father, Bob Marley, coming from the poor part of town, thus him being "a tree halfway in between the 'rich' world and 'poor' world." Additionally, Halfway Tree is a well-known landmark that marks the cultural center of Half-Way-Tree, the clock tower that stands where the historical eponymous cotton tree once stood is featured prominently behind Marley on the cover of the album. 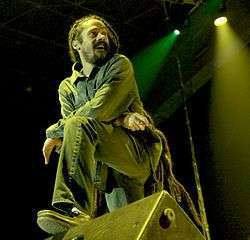 The album was released on 11 September 2001 and received the 2002 Grammy Award for Best Reggae Album. It was co-produced by Damian Marley and his brother Stephen Marley. Marley released his third studio album Welcome to Jamrock which was released on 12 September 2005 in the United States and 13 September 2005 in the United Kingdom. The sold 86,000 copies in its first week of release, and was eventually certified gold after selling 500,000 copies in the United States. Other notable singles from the album include "The Master Has Come Back", "Road to Zion" featuring Nas, and "Khaki Suit" featuring Bounty Killer and Eek-A-Mouse. Damian's brother, Stephen Marley, was a producer and co-writer of the hugely successful song of the same name. The lyrics to the single "Welcome to Jamrock", which was performed over a riddim produced by Sly and Robbie for Ini Kamoze some 20 years earlier, centred around poverty, politics and crime in Jamaica. While the single was controversial at home over its perceived negative viewpoint of the island, many praised the content of the song. Dr. Clinton Hutton, professor at the University of the West Indies, said of the single, "'Jamrock' uses the icon of the inner city, of alienation, of despair, of prejudice, but of hope, of Jamaican identity, to remind us of the fire of frustration, the fire of creativity, the fire of warning to open up our eyes and look within to the life we are living. And still some of us don't want to hear and to look and say enough is enough." The single reached No. 13 on the UK Singles Chart and No. 55 on the US Billboard Hot 100 chart. It was also No. 100 on the Top 100 Songs of the Decade listing by Rolling Stone. At the 2006 Grammy Awards, he won Best Reggae Album and Best Urban/Alternative Performance for Welcome to Jamrock. He is the only Jamaican reggae artist in history to win two Grammy Awards on the same night. He is also the only reggae artist to win in the Best Urban/Alternative Performance category at the Grammy Awards. At the 2009 Grammy Awards news of a collaborative album between Marley and Nas was announced, when Nas told MTV reporters "Right now, I'll tell you first, I'm working on an album with Damian Marley. We tryin' to build some schools in Africa with this one, and trying to build empowerment. We're tryin' to show love and stuff with this album. So, the record's ... all about really the 'hood and Africa also as well." On 17 May 2010, Marley released Distant Relatives, a collaborative album with Nas. The album title refers not only to the bond between the artists, but the connection to their African ancestry, which inspired the album both musically and lyrically. They have previously collaborated on "Road to Zion", on Marley's Welcome to Jamrock album. The album joins two different flavours of music with Marley's dub-rock aesthetic and Nas' flow. Damian and Stephen produced much of the album. The proceeds of this album will go to building schools in the Congo. The album debuted at number five on the US Billboard 200 chart with first-week sales of 57,000 copies. It serves as Nas's tenth top-ten album and Marley's second top-ten album in the United States. The album also entered at number four on Billboard's Digital Albums, and at number one on its R&B/Hip-Hop Albums, Rap Albums, and Reggae Albums charts. Internationally, Distant Relatives attained some chart success. It entered at number 33 on the European Top 100 Albums chart. In the United Kingdom, it debuted at number 30 on the UK Albums Chart and at number four on the R&B Albums Chart. In Canada, the album entered at number 9 on the Top 100 Albums chart. In Germany, it debuted at number 38 on the Media Control Charts. The first single, "As We Enter", was released on iTunes on 23 February 2010. It has so far peaked at No. 10 on the iTunes Hip Hop/Rap charts and No. 41 on the iTunes Music charts. The single debuted at number 39 on the UK Singles Chart. At a sold-out panel discussion on the African diaspora and its relation to music, sponsored by National Geographic, Damian and Stephen Marley and Nas were among the several hip hop and reggae musicians voicing their solidarity. The discussion focused on the collaborations between artists of the two genres, and highlighted the Distant Relatives project. The existence of SuperHeavy was secret until May 2011. Mick Jagger, English musician and the lead vocalist of rock band The Rolling Stones, announced its formation on 20 May 2011. SuperHeavy was Dave Stewart's idea. Inspired by the sounds washing into his home in St Ann's Bay, Jamaica, Stewart urged Jagger to fuse their sound with that of Indian orchestras. Stewart and Jagger had mutual liking for Indian orchestrations; thus, A. R. Rahman was added to the supergroup. The name of the band is said to be inspired by Muhammad Ali. The group began recording their self-titled debut album in early 2009 at a studio in Los Angeles. They recorded about 35 hours of music, with some songs originally lasting "an hour and 10 minutes" before they were whittled down. The album was previewed at Jim Henson Studios, Los Angeles, on 30 June 2011. The band played eight of the recorded songs at the event. "Miracle Worker" was released on iTunes as the album's lead single on 7 July 2011. It is a reggae song performed by Marley, Stone and Jagger. The single entered at number 195 on the UK Singles Chart. The music video was released on YouTube on 12 August 2011. Directed by Stewart and filmed at Paramount Studios in Los Angeles, the video features all five members of the band. "Satyameva Jayathe" (the national motto of India, which literally translates as "Truth Alone Triumphs") was released as the second single from the album on 9 August 2011, a week before India's Independence Day on 15 August. Composed by Rahman to have an Indian feel, Jagger sings in Sanskrit on the song, which also features Stewart, Stone and Marley. The song premiered exclusively on Radio Mirchi 98.3 FM on 9 August across twenty-two Indian cities, and Tata DoCoMo is set to simultaneously promote the song and the album on mass media. "Beautiful People" reached number sixty-four on the Dutch Single Top 100 chart. Damian also worked with electronic artist Skrillex on a song called "Make It Bun Dem" in 2012. This song also appears in the 2012 game Far Cry 3. Affairs of the Heart was a massive hit in Jamaica, topping the reggae charts. Damian Marley will release his 4th studio album, titled Stony Hill, on January 20th 2017. Backed by the first single Nail Pon Cross, released in August 2016. Marley has described his music as "dancehall and reggae. I've noticed ... people trying to separate the two of them," he continues. "It's Jamaican culture in general. I don't try to classify or separate." Distant Relatives Fused hip hop and reggae musical elements, Marley and Nas also incorporated samples from African music into the album. The album's lyrical content heavily revolves around themes concerning Africa, from ancestry and poverty, with social commentary of the United States and Africa. The track "Count Your Blessings" reflects on the plight of Africa. 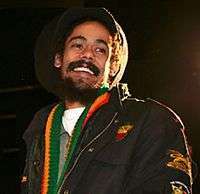 Damian Marley was nicknamed "Jr. Gong" in honour of his legendary father, Bob "Tuff Gong" Marley. His mother, Cindy Breakspeare, is a Jamaican jazz musician, former model and crowned Miss World 1976. After seeing the movie Damien: Omen II, which is about the coming of the Antichrist, one of Bob's last requests in Germany was to have Damian's name changed. "Damien being a devil...It was inappropriate for him as a Rastafarian to have a child with that name," Bob said and Damian's name was later changed. — — — — "—" denotes releases that did not chart. 2007 "Now That You Got It"
↑ Bob Marley: All His Children & 9 Baby Mommas. FeelNumb.com (2011-07-26). Retrieved on 2016-05-03. ↑ Bush, Jon. Damian "Junior Gong" Marley biography. Rovi via MTV.com. Retrieved 3 March 2011. ↑ Mills, Claude. Damian Marley: Conveying solid, conscious lyrics. Jamaica Gleaner. 2 January 2003. Retrieved 2 March 2011. ↑ "Damian Jr. Gong Marley the Afiwi Interview". Afiwi.com. 10 February 2002. Retrieved 13 July 2011. 1 2 Boyne, Ian. 'WELCOME TO JAMROCK' – A phenomenon. Jamaica Gleaner. 2 October 2005. Retrieved 2 March 2011. ↑ Evans, Teino. Grammy welcomes Jamrock – Jr. Gong speaks about his double victory. Jamaica Star. 10 February 2006. Retrieved 2 March 2011. ↑ Henry, Krista. Old beats, new hits. Jamaica Star. 15 December 2006. ↑ Cooke, Mel. 'Welcome to Jamrock': A celebration of culture and talent. Jamaica Star. 12 September 2005. Retrieved 2 March 2011. 1 2 Roberts, David (2006). British Hit Singles & Albums (19th ed.). London: Guinness World Records Limited. p. 350. ISBN 1-904994-10-5. ↑ Billboard Singles Chart (Welcome to Jamrock-Damian Marley). AllMusic. Retrieved 3 March 2011. ↑ 'Jamrock' stands alone. Jamaica Gleaner. 15 December 2009. Retrieved 2 March 2011. ↑ Reid, Shaheem (9 February 2009). "Nas Confirms Kelis' Pregnancy, Talks New Album". MTV News. Retrieved 8 April 2009. ↑ Brunstad, Svein. Nas and Damian "Jr. Gong" Marley are Distant Relatives (Interview). URB. 19 April 2010. Retrieved 3 March 2011. 1 2 Caulfield, Keith. 'Glee' Stops the Show at No. 1, Stones Come in Second On Billboard 200. Billboard. Retrieved on 26 May 2010. ↑ Digital Albums – Week of June 05, 2010. Billboard. Retrieved on 27 May 2010. ↑ R&B/Hip-Hop Albums – Week of June 05, 2010. Billboard. Retrieved on 27 May 2010. ↑ Rap Albums – Week of June 05, 2010. Billboard. Retrieved on 27 May 2010. ↑ Reggae Albums – Week of June 05, 2010. Billboard. Retrieved on 27 May 2010. ↑ "Nas & Damian Marley – Distant Relatives". Ultratop. Retrieved 27 May 2010. ↑ Album Performance: Distant Relatives. acharts. Retrieved on 27 May 2010. ↑ European Albums – Week of June 05, 2010. Billboard. Retrieved on 27 May 2010. ↑ The Official UK Top 40 Albums Chart – 23 May 2010. BBC Online. Retrieved on 27 May 2010. ↑ UK Top 40 RnB Albums – 23 May 2010. BBC Online. Retrieved on 27 May 2010. ↑ Canadian Albums: Top Albums Chart. Billboard (2010-06-05). Retrieved on 2016-05-03. ↑ Album Top 50 KW 20 – Gültig ab 28.05.2010. MTV. Retrieved on 28 May 2010. ↑ Single Cover: Nas & Damian ‘Jr. Gong’ Marley – ‘As We Enter’. Rap-Up. ↑ The Official UK Top 40 Singles Chart – 23 May 2010. BBC Online. Retrieved on 27 May 2010. ↑ The Source, Nas and Damian Marley Distant Relatives Coming in 2010, TheSource.com, 14 December 2009. Accessed 6 January 2010. 1 2 "Mick Jagger Forms Supergroup with Dave Stewart, Joss Stone and Damian Marley". Rolling Stone. 20 May 2011. Retrieved 11 August 2011. ↑ "SuperHeavy has a strong Indian influence'". MiD DAY. 25 September 2011. Retrieved 19 October 2011. ↑ Baltin, Steve (1 July 2011). "Mick Jagger and SuperHeavy Preview Album, Ponder Tour in Los Angeles". Spinner.com. Retrieved 3 July 2011. ↑ "Miracle Worker – Single by SuperHeavy". iTunes Store UK. Apple Inc. Archived from the original on 11 July 2011. Retrieved 15 August 2011. ↑ Winistorfer, Andrew (8 July 2011). "Super Heavy: "Miracle Worker"". Prefix Magazine. Retrieved 10 August 2011. ↑ Wilkening, Matthew (7 July 2011). "SuperHeavy, 'Miracle Worker' – Song Review". Ultimate Classic Rock. Retrieved 10 August 2011. ↑ "CHART: CLUK Update 27.08.2011 (wk33)". The Zobbel Website. Retrieved 10 September 2011. ↑ "SuperHeavy – Miracle Worker". YouTube. 12 August 2011. Retrieved 12 August 2011. ↑ Salvadore, Sarah (22 July 2011). "Rahman's new approach". The Times of India. Bennett, Coleman & Co. Ltd. Retrieved 9 August 2011. ↑ "Rolling Stone Mick Jagger sings in Sanskrit". BBC News Online. 10 August 2011. Retrieved 11 August 2011. ↑ "A R Rahmans Satyameva Jayathe releases!". The Times of India. Bennett, Coleman & Co. Ltd. 9 August 2011. Retrieved 9 August 2011. ↑ "SuperHeavy – Beautiful People" (in Dutch). dutchcharts.nl. Hung Medien. Retrieved 25 September 2011. ↑ "Listen: Skrillex & Damian Marley "Make It Bun Them"". Complex Music. 17 April 2012. Retrieved 20 April 2012. ↑ JAMAICA MUSIC COUNTDOWN CHARTS – Page 3 – Wha Gwaan – OzReggae.com Forum. Forums.ozreggae.com. Retrieved on 2016-05-03. ↑ Henry, Krista. Music a means, a message. Jamaica Gleaner. 22 December 2006. Retrieved 3 March 2011. 1 2 "Nas Announces Damian Marley Album". MTV One. 8 April 2009. Retrieved 29 April 2009. 1 2 Vozick-Levinson, Simon (22 April 2009). "Nas and Damian Marley on their 'Distant Relatives' collaboration". Entertainment Weekly. Time. Retrieved 29 April 2009. ↑ Thiessen, Brock (8 April 2009). "Nas and Damian Marley Become Distant Relatives, Join Rock the Bells Tour". Exclaim!. Retrieved 29 April 2009. ↑ Reid, Shaheem (7 April 2009). "Nas And Damian Marley Team Up For Rock The Bells Tour, Joint Album". MTV News. Retrieved 29 April 2009. ↑ "Spring Music Preview: June". Rolling Stone. Wenner Media. 20 March 2009. Retrieved 8 April 2009. 1 2 3 Damian Marley page. Lescharts.com. Retrieved on 2016-05-03. 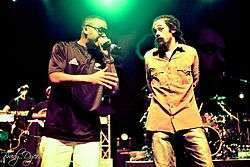 ↑ "Gold & Platinum: Damian Marley". Recording Industry Association of America. Retrieved April 22, 2016. ↑ "Damian Marley 2015 Catch A Fire Tour Schedule With Stephen Marley, Morgan Heritage & Tarrus Riley". May 14, 2015. Retrieved May 14, 2015. ↑ "Ghetto Youths International presents Set Up Shop, Vol. 2 by Various Artists on Apple Music". ↑ "Ghetto Youths International Presents Set Up Shop, Vol. 3 by Various Artists on Apple Music". ↑ "Tulisa scores fastest selling debut smash hit of 2012 with Young". Officialcharts.com. Retrieved 16 December 2012. ↑ "ARIA Charts – Accreditations". Australian Recording Industry Association. Archived from the original on 21 July 2011. Retrieved 17 January 2013. ↑ "Canadian certifications – Skrillex". Music Canada. Retrieved 21 January 2013. ↑ "Canadian Hot 100: Oct 1, 2010". Billboard. Nielsen Broadcast Data Systems. 1 October 2010. Archived from the original (PDF) on 3 October 2010. Retrieved 3 October 2010. 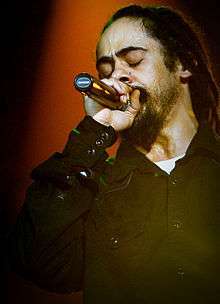 Wikimedia Commons has media related to Damian Marley. "The Master Has Come Back"
"Wanted (Just Ain't The Same)"
"Now That You Got It"